Stuartholme offers an extensive curriculum, based on teaching students ‘how to learn’, rather than memorising, rehearsing and recalling information. This focus on deeper learning means Stuartholme girls graduate with a much richer education. It also provides them with the tools to know what to do, when they don’t know what to do. Effective study techniques are taught to ensure students are well prepared to achieve their study goals both at school and after they graduate. Informed by research of effective teaching and learning practices (Marzano and Bloom) and growth mindset (Dweck), the Junior School courses focus on developing higher-order thinking skills, with a focus on analysing, evaluating and justifying. Students in Year 7 and 8 undertake a broad curriculum by studying all eight Key Learning Areas (KLAs) / Core Subjects. This introduces them to core and elective subjects which they can choose in Years 9 and 10. 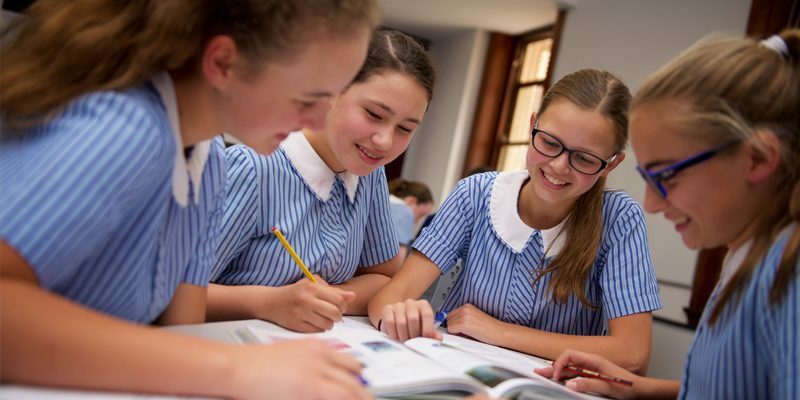 In Year 9 students continue studying core subjects along with two elective subjects. Whilst the core subjects provide students with a broad educational base, the electives allow students the freedom of selecting subjects they are interested in. Elective subjects are studied for two years, continuing into Year 10. By the time students reach Year 10, they commence their transition to Senior School. The key focus in Year 10 is to assist students in choosing the most suitable pathway for their Senior studies. Facilitated through Academic Services, an Education Planning and Assessment Program is developed for each student. Accompanied by a parent, each student has a career development session with the School’s Career Advisor. Through a career testing process early in Year 10, our Advisor helps students to identify their strengths and skills, areas of interest and distinctive personal style. Possible career goals, along with school performance and Senior subjects are also discussed. A Senior Education and Training Plan (SET Plan) is then developed for each student. Stuartholme offers several tertiary pathway options and provides a range of OP, non OP and/or Vocational Education & Training (VET) subjects. The academic focus for students in Years 11 and 12 is on achieving her personal best for tertiary entrance. As students’ progress through Years 11 and 12, they are continuously assessed in each of their subjects. These assessments are monitored by the Queensland Curriculum and Assessment Authority (QCAA), and at the end of Year 12, the QCAA will issue a Student Education Profile. This profile contains an overall measure of achievement based on a student’s best five subjects; a student’s level of achievement in each individual subject on the Senior Certificate; individual results from an externally organised Core Skills Test; and Field Position assessments of a student’s achievements in specific fields of study. There are also continued opportunities for extension and enrichment for Senior Students. To view the current subjects being offered to Year 12 2019 students please click here. Away from the classroom students can explore opportunities to enhance their schooling. The range of sporting, creative arts and enrichment co-curricula activities allow each girl to build her self-confidence and develop her talents and interests. Stuartholme offers a flexible and challenging Academic Enrichment Program which focuses on encouraging gifted and talented students to understand and utilise their unique intellectual abilities. The School’s progressive curriculum is supported by student mapping technology used to identify the learning needs of every student. Our expert staff then provide the resources to either support or extend, and challenge students to optimise pathways for their future learning. Stuartholme’s online learning system and communication portal is accessible by parents, who can review their daughter’s progress in real-time. Academic results are uploaded onto their daughter’s report allowing parents to monitor their daughter’s progress throughout the year, and not only when Semester reports are issued. Parents can readily see the trends or changes at the same time as their daughter and her teachers, which assists in the dialogue and partnership between parent and teacher. Stuartholme’s highly qualified teachers and specialist staff are experts in their fields and challenge their students to become independent, critical thinkers, arming them with the confidence to actively engage in their learning. The way they teach is aimed at empowering each of the young women in their care to be the agents of change, instilling the self-knowledge that their thoughts and actions have the ability to make an impact. Each student is an individual with different strengths and limitations, which is why our teachers focus on growth for every learner, regardless of their starting point. As technology continues to grow and evolve, it is important for educators to ensure students have access to a range of digital platforms. In the Stuartholme classrooms, teachers use multiple digital technology tools aimed at enhancing, consolidating and maximising learning for the girls. Learn about our Bring Your Own Device (BYOD) program.